While Winter 2018 is still officially a few weeks away, this Thanksgiving snowfall we experienced here in Connecticut is a good reminder that New England Winters can bring some extra wear and tear to your roof. As a home or business owner there are definitely winter maintenance steps you can take to help get your roof through another Connecticut Winter. The first few steps are things to do immediately, before any winter precipitation takes place. The remaining steps are things you should do once snow and ice has made an appearance. Clean and then Check Your Gutters – one of the first places that frozen precipitation – ice, sleet and snow – will accumulate is your gutters. That’s why it’s important to clear them of fallen leaves, twigs and nuts and then check them regularly for any signs of ice dams. One rule of thumb is that if you see icicles hanging off of them, you’re likely already looking at a build-up. The first concern is that if they’re filled with ice, your gutters can simply become weakened, unable to hold all that weight. As a result, they can tear away from your home, creating structural damage and the potential for a major repair bill. Getting rid of all ice dams at the first sign of formation is key to keeping your gutters strong and working properly. Inspect and Repair Flashing – once you’ve checked the gutters, take a look at the flashing you’ll find at various spots on your roof. It provides defense against water incursion in your roofs most vulnerable areas – joints, valley and the area around penetrations. Even if it was installed correctly years ago, over time it can become warped or even loosened. If you discover that it’s faulty and you are unfamiliar with how to repair it, you should contact a professional to get it fixed as soon as possible. Impaired flashing will allow the melt off from snow and other icy precipitation to more freely enter your roof. If too much excess moisture builds up, this situation could quickly escalate to an interior leak. 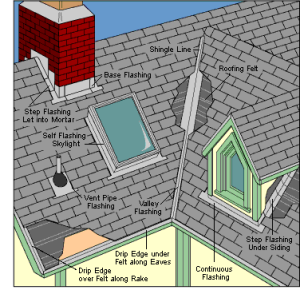 While inspecting the flashing, you should also survey your asphalt or wood shingles. If any are beginning to peel up or chip, or have become cracked or otherwise damaged, you should have them replaced immediately. Left unremedied, they will also allow moisture to build and potentially seep into your ceiling. Clear Organic Debris – the last thing to do while up on your roof prior to the onset of a winter storm is to clear your roof, gutters (mentioning again because it’s that important!) and downspouts of branches, twigs, pine needles, leaves, and other grime that can accumulate on its surface. This might also be a good time to eradicate excess moss or algae that has built up – the Asphalt Roof Association has some great tips on this. Use a bamboo rake or broom to clear as much as possible in the late fall to keep your roof clear all winter long. This assures that when a storm does hit, the wintry mix doesn’t have an extra grip on your roof. If it sticks to debris, those little pieces can become waterlogged and eventually rot, leading to a leak or other damage. Check Your Attic Ventilation – once you are done up on the roof, your next task is to venture into the attic to check the ventilation system. You might not realize this but the performance of your attic is directly linked to the performance of your roof. Here’s why: in the winter, allowing a natural flow of outdoor air to ventilate the attic helps keep it cold, which reduces the potential for ice damming. It also helps to minimize the formation of condensation in your attic, which can lead to water incursion. When performing your attic inspection, make sure the vents are clear and free of debris, that there is nothing blocking airflow to and from the vents and that your attic has sufficient insulation. Keeping the airflow consistent is key to keeping your roof as protected as possible. 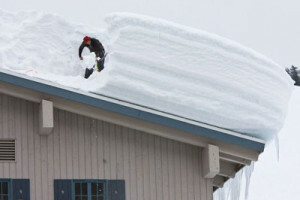 Remove Excess Snow ASAP – while snow on a rooftop can look postcard perfect, it can also wreak havoc if too much of it is left to sit for too long. Along with ice, snow creates a heavy weight on your roof which means that anywhere your roof is even slightly compromised could be at risk of major damage. What’s more, if snow and ice remains on your roof, it can also create the aforementioned ice dam when it melts. Water on a roof is nothing new, but it’s the re-freezing that creates the issue. When temperatures drop below freezing (usually overnight), the melted ice hardens back up again. 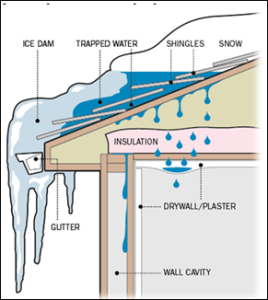 As a result, it creates an ice dam in or around your gutters, backing up any runoff precipitation. This can loosen your shingles or even create a leakage. Our rule of thumb is that anything in excess of 6 inches should be addressed. Remove ice and snow from your roof as quickly, thoroughly and as SAFELY as possible to keep it dry longer. As the conditions can make the surfaces slippery, it’s often wise to hire a roof maintenance company to come and take care of the issue for you. Also, care must be taken to not damage your roof in the process of removing snow or ice. These tips from website HouseLogic line up with what we generally tell homeowners. Remediate All Wind Damage – along with snow, sleet and ice, the strong winds are also a threat to your roof in winter. If a major storm comes through your area, strong wind and the tree branches it carries can be just as detrimental as any form of wet precipitation. After a storm, once it’s safe to do so, inspect your roof for any signs of wind damage, and take steps to repair any spots that may have become compromised. Just like your pre-winter inspection – here you are looking specifically for missing, broken, or damaged shingles or other roofing materials. If left untreated, these vulnerable spots won’t just open your home up to leaks. They’ll also serve as breeding grounds for some pretty nasty bacteria, mold, and mildew. So, contact your roof maintenance professional to come patch or replace any areas that wind tears away. Hire a Professional – while you might be a little averse to climb atop your roof in winter to inspect after a storm, clear an ice dam or make post-storm reparations, it’s what we do for a living. And if we are busy with another winter storm issue (they tend to happen in bunches! ), we’ll recommend another trusted contractor. By letting experts take the reins, you’ll not only save your back and ensure your safety, you’ll also have the peace of mind that everything is properly checked and repaired. That way, you can enjoy the winter and all the festivities it brings without having to stress or worry about the condition of your roof. Contact us if you have any concerns or experience any winter weather incidents which make you concerned about your roof. We are available for emergency service.